Teachers For Social Justice: SUPPORT GROWS! 200 University faculties support parents & teachers at Saucedo & Drummonds schools! SUPPORT GROWS! 200 University faculties support parents & teachers at Saucedo & Drummonds schools! 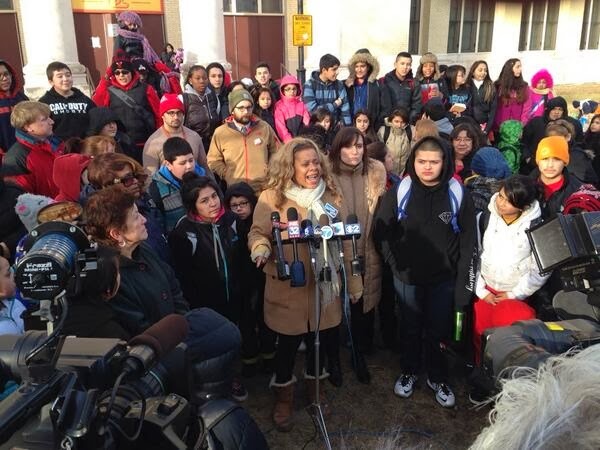 As university faculty whose responsibilities include preparing future educators, we support the action of teachers at the Saucedo and Drummond elementary schools in Chicago who are refusing to administer the Illinois Standard Achievement Test (ISAT). Over a decade of research shows that an over emphasis on high-stakes standardized tests narrows curriculum, creates social and emotional stress for students and families, drives committed teachers out of the profession, and turns schools into test-prep factories with principals forced to comply as overseers—especially in low-scoring schools. We understand assessment as the process of gathering evidence about learning, from multiple sources, so that teachers can better support student learning. The ISAT, in contrast, contributes virtually nothing. CPS no longer uses the ISAT for promotion, graduation, or eligibility for selective-enrollment schools and is phasing it out after this year. It is not aligned with Common Core State Standards—which, regardless of how one sees them, Illinois has already adopted—and does not help teachers improve student learning. The pre-service teachers with whom we work are demoralized about a future of teaching in such a test-driven atmosphere. We teach our students—future educators—to stand up for their students, families and communities, and to take principled stands for social justice. That's what the Saucedo and Drummond teachers are doing. We applaud them and stand with them. 115. Benay Blend, Central New Mexico Community College, Humanities Dept. 154. Michelle Maher, Oregon State University, Teacher and Counselor Education Dept. 195. Jennifer Cannon, University of Massachusetts Amherst, Teacher Education and Curriculum Studies Dept. 198. Kate Sheesh, Hunter College (CUNY), Psychology Dept.